Shown here is a tops down view of the stand that measures 8.3 inches (21.2 centimeters) handle to handle and 6.9 inches (17.5 centimeters) wide. 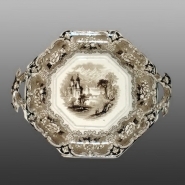 An octagonal shaped ironstone sauce tureen with ladle and stand printed in brown with the Udina pattern. The center design includes four small figures in the foreground, a river running from the central ground to the distant mountains and clouds in the background. A castle with tall, slender towers sits on the left bank mid-ground where a nearby arched bridge spans the river. Large trees frame the view on the right side. The border pattern includes peonies placed in baroque scrolled reserves with bell flowers placed in the corners between the reserves. Much of Clementson's production was exported to the United States and Canada.